A Jewish-American war veteran shared his personal Korean War story with those who participated in a ceremony to mark the 61st anniversary of the outbreak of the war held at the South Korean Embassy to Israel in Tel Aviv last Thursday. Leonard Wisper said that the Korean War (1950-53) was a turning point in his life as he was rescued from the brink of death, later leading him to affiliate with Judaism. Wisper was drafted to the U.S. army in 1951, a year after the war began, to serve in a machine gun unit. During the fratricidal war, his unit was attacked by Chinese troops and he and his fellow soldiers were severely wounded. In a statement released by the South Korean Embassy Monday, the war veteran recalled that he was lying on a hill, bleeding, praying for God to rescue him. Wisper was taken to a bunker by Chinese soldiers and there he saw many wounded American soldiers. The intense war memory led Wisper to connect with Judaism. After the war, he left the United States to settle down in Israel. 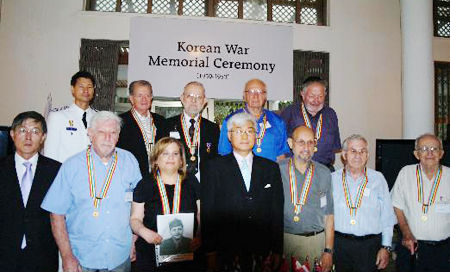 Wisper was one of seven Jewish Korean War veterans who received special medals awarded by the Korean government during the event. Ambassador Ma Young-sam, 54, granted the medals on behalf of the government during the Korean War Memorial Ceremony 2011. Ambassador Ma also delivered the government’s sincere gratitude to Israel for its active role in providing food and medical assistance to South Korea and in the adoption of a truce resolution at the United Nations. Data about foreign soldiers from a Jewish background was unavailable before. But the Korean envoy’s two-year-long effort to track down Jewish Korean War veterans led to the discovery of about 4,000 Jewish soldiers that were dispatched to South Korea. Ambassador Ma located several Jewish war veterans living in Israel and invited them to the 61st anniversary of the war ceremony. The Korean War claimed about 40,000 foreign soldiers from 16 countries including the United States, France and Canada.